Everyone likes a garden that is clean and neat appearing. Weeding, thinning and cultivating are necessary tasks for every gardener who takes pride in keeping his or her garden in proper order. However, in almost every garden, large or small, there is apt to be a corner where grass clippings, dead weeds and similar debris are placed either for a temporary period or for the purpose of making a mulch. Very often, rocks, stones, paper and old boards eventually find their way to such a convenient dumping ground. Under conditions such as this, the garden breeds trouble. Besides being unsightly, these piles offer a perfect breeding ground for numerous enemies of the garden. To be sure, the grass clippings and other vegetation will make a suitable mulch; but such matter should be turned over at intervals, and all foreign matter should be removed in order to insure it against the breeding of various insects. Garden slugs, which measure from five to six inches in length, feed by night and eat large ragged holes in all sorts of flowers. In coldframes or hotbeds, they attack and completely destroy the young seedlings. With an undisturbed pile of mulch or debris at their disposal, they will hide from sight by daylight and commence their destruction in the garden shortly after sunset. Old boards, rocks, paper; in fact most anything that is allowed to lie for any great length of time will house garden slugs. They are capable of great destruction; in order to check their activity, the removal of debris and of the mulch pile is necessary. The mulch can be transferred to a new location from time to time. Years ago, when I was in knee pants and learning about gardening the hard way, I watched in amazement as my mother and grandmother hunted slugs. So many were there in our vicinity, that I remember seeing them in the old-fashioned dirt cellar of our house. However, the slugs, bold as they were, did not live long enough to cause any particular damage. My grandmother, armed with a box of ordinary table salt, would pour a substantial amount on the pests, and within a few minutes, they would actually dissolve before our eyes. This method of destroying slugs is simple, practical and economical. However, it does pay to remove the breeding places and keep the garden clean. In damp areas, the threat of garden slugs is doubled. They cannot survive if they cannot find some sort of cover, thus the attention of the gardener to the mulch pile and to any form of debris in or near the garden will discourage them. The use of poisons against them or any garden pests is not advisable; at least where domestic pets or children are apt to come in contact with them. If the salt trick fails, or does not appeal to the gardener, the use of a shovel or a hoe as a weapon will do as well. 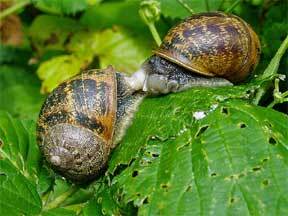 Snails are close relatives of slugs, practically the only physical difference is the wearing of a hard shell. Removal by hand seems to be the best method in which to dispose of them. The yellow-white eggs can be found in masses in dark, damp places, and are easy to destroy. Sowbugs, or “pillbugs,” are common in the garden. These are the bugs we find so often underneath stones and boards and under piles of wet grass. They are about a half inch in length and are dark gray in color. When exposed to the sun, some species will roll themselves up into a pill shape; thus giving themselves the nickname of “pillbugs.” Their special food seems to be carnations and sweet peas, but they will readily attack many other plants as well. In greenhouses, they appear under damp pots. Here again, the best method of control is to remove all rubbish. In the greenhouse, the floor should cleaned at regular intervals, depending upon the dampness and the number of pests that are noticed. In decaying organic matter such as manure, millepedes or “thousand-legs” will very often be found. These strange pests are not insects, as insects never have more than six legs. Rather, they are worm-like creatures, being brown, reddish-brown, or gray in color, and having hard shells. Principally night workers, they too hide by day under any form of refuse within their reach. Their fondest choice for a hide-out is any damp, decaying organic matter, and here they are found in great numbers. They are difficult to catch or kill, as they run rapidly when disturbed, and it would be wise to burn all dead leaves, papers, weeds and other similar matter. If it is necessary to maintain a pile of manure on the premises, it should be kept some distance away from the garden. Millepedes will often bore into the roots, tubers and stems of a number of plants. They live on freshly planted seeds, and will also eat leaves and fruits that come in contact with the ground. Burn and destroy all possible breeding places. A dead tree or stump is an invitation to termites. Despite the fact that termites for the most part will attack old buildings and rotten wood, they can become dangerous garden pests as well. They will breed in dead stumps and trees, enter the ground, and attack the living roots of shrubs, plants and trees. Wounded or dying roots offer food for them, and once they feed on them, they will follow through to the live wood. The worker termites with which we are concerned are white, soft-bodied, wingless insects and are not, as many people think, true ants. They are about one-quarter of an inch long. Careful pruning of all dead or dying branches on shrubs and trees will do much in controlling termites. The removal of dead stumps is, of course, very practical. A caterpillar pest that welcomes decaying leaves and all sorts of trash for a home and breeding ground is the yellow woolly bear. Attacking almost every garden plant, it devours the leaves, stems and buds, leaving the plants ragged and drooping. This hairy caterpillar makes from 20 to 30 cocoons under a trash pile and almost always every one will hatch, since it is an extremely hardy species. Among its favorite plants are the moon-flower, morning-glory, petunia, salvia, snapdragon, verbena, violet, hollyhock, dahlia, chrysanthemum and sunflower. If the trash pile is not checked, the woolly bear is likely to overrun the garden. It is unusually active during the months of July and August and into September. These six common garden pests are widely distributed. Each will become a threat to plants of all types where refuse is to allowed to stand. The cleaner the garden, the less chance of any devastation from them. They are inclined to be active from – early Spring to late Autumn. To add to the beauty and protection of your garden, keep everything clean. Remove all refuse and destroy it. There is no need to let your garden breed trouble. Protect your plants by gaining a permanent and victory over every breeding place. It takes effort, but the results are worth it.